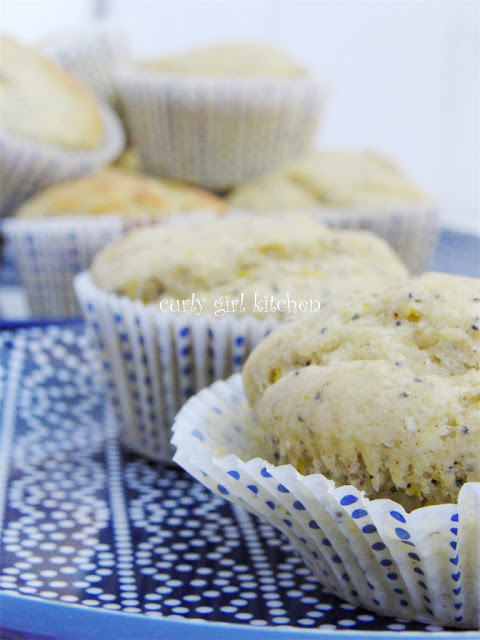 Poppy-seed muffins were among my favorites growing up - I've mentioned before that in junior high, my sister and I started doing a little cooking, consisting mostly of boxed muffin mixes and canned beef stew over rice - and we probably made lemon poppy-seed muffins for dinner just about every week. I've been wanting to make an orange muffin lately, and was dreaming up a recipe for Chocolate Chip Orange Muffins, but those will come another time. Having a three-day weekend (with both Jamie and I having President's Day off work), we really needed a completely relaxing Saturday morning, and relaxing it was. We started the morning with cold mimosas, in fancy champagne glasses and everything! 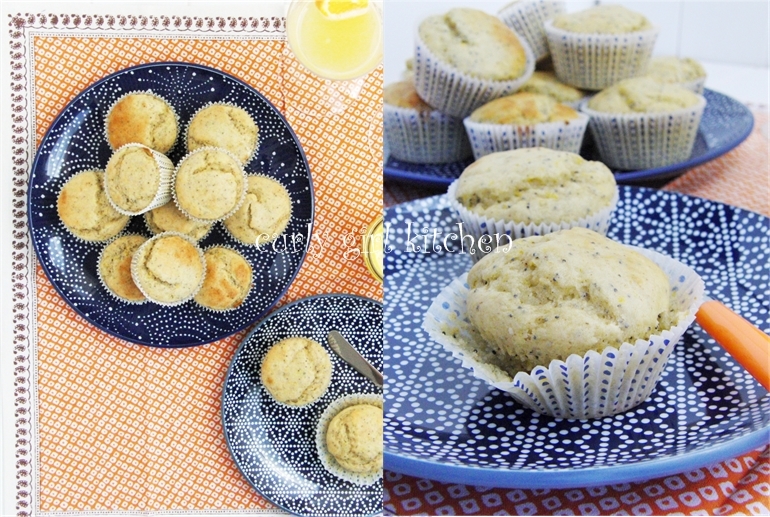 Then I baked these scrumptious muffins, which were surprisingly low in WW points (good thing I didn't include the chocolate chips), and to spread on the muffins, a slightly sweet and tangy orange curd with a hint of vanilla from the vanilla sugar I used. You can easily make vanilla sugar by placing a leftover vanilla bean (one that you've already scraped the seeds out of) into a 2-cup glass jar and filling it up with granulated sugar. Put the lid on and put it away for a few weeks or a month, and you'll have a deliciously scented vanilla sugar. (The sugar will absorb a little moisture from the vanilla bean, so you may have to use a whisk to break up any lumps before using it.) The vanilla sugar was just perfect in this orange curd recipe. Of course, if you don't have vanilla sugar, you could also just whisk in a little vanilla at the end, after you add the butter. 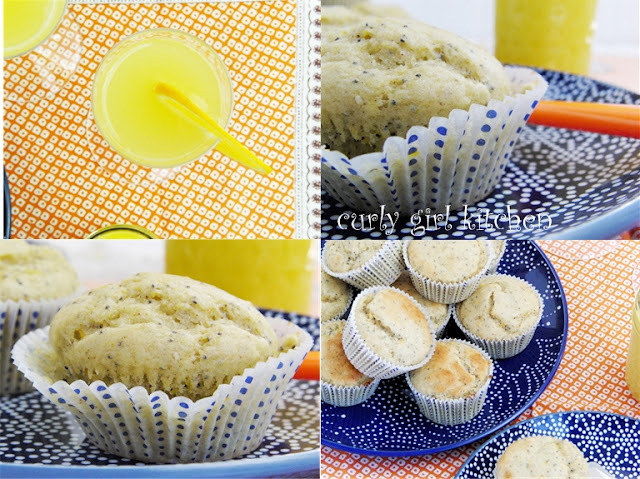 Jamie loved these muffins with the orange curd, and they are now some of my favorites as well. It was a wonderfully relaxing day in our PJs of mimosas and episodes of Entourage. And for dinner, we were thrilled to realize we could get sushi delivered from our local sushi restaurant. So we didn't even have to get dressed. Sometimes, you just need one of those days. Whisk together the yogurt, orange juice, orange zest, sugar, oil, egg, vanilla and almond extract. 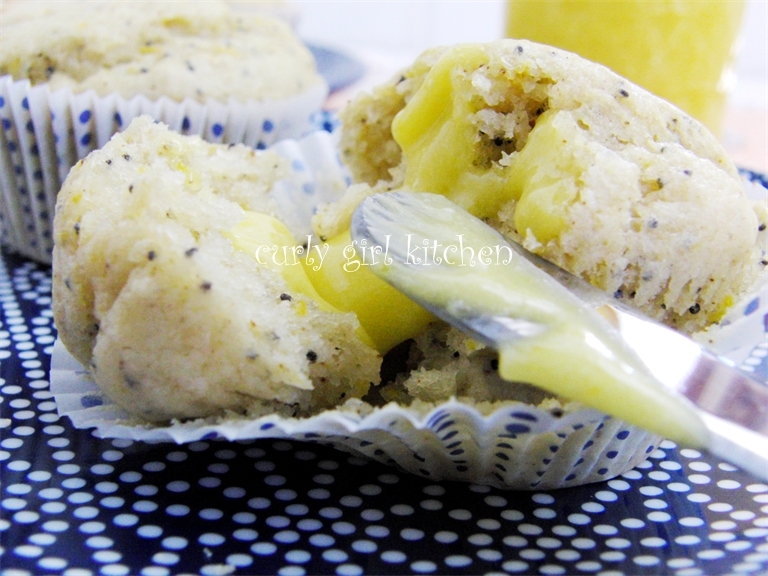 In a separate bowl, combine the flour, baking soda, baking powder, salt, cloves and poppy-seeds. Add the dry ingredients to the wet and stir just until combined. Divide the batter between the muffin cups, filling them about 3/4 full. Bake at 350 for 18-20 minutes until a toothpick inserted in the center comes out clean. Fill a saucepan with about 2 inches of water and bring to a simmer over medium to medium low. In a heat-proof metal mixing bowl (one that can sit on top of the saucepan without touching the water) whisk together the egg yolks, sugar, orange juice and orange zest until smooth (1-2 minutes). (Note that 2 large navel oranges will yield enough zest and juice for this recipe). Pour into a glass jar and store in the fridge until ready to use. It will be at a spreadable consistency straight from the fridge, or you can gently rewarm it for a "pourable" consistency. Yields about 1 2/3 cups.